Before you get an answer to the question “How much does a lawyer cost?” and opt to not fight your DUI in Georgia, spend some time learning more about the DUI penalties and long-term consequences of a DUI conviction. Plus, since you are NOT a drunk driving defense lawyer, you cannot judge how good or how bad your DUI GA case may be. If you had been diagnosed with cancer, would you be able to judge your chances of survival? Of course not. You need an EXPERT DUI specialist to do that, and we offer payment plans to help you with your DUI lawyer cost. That is why you must take time to get your DUI case reviewed by a top Atlanta DUI lawyer. Your best chance for winning is to find a lawyer who is THE true expert DUI attorney who has a proven track record of knowing how to beat a DUI. DUI penalties and long-term consequences of a DUI conviction will haunt you for decades, if not the remainder of your life. It can be far more expensive to NOT fight a DUI case and try to deal with impediments and limitations on your future business and family plans, than the relatively minor DUI lawyer cost needed to hire the best DUI lawyer in Georgia. The legal field has attorneys in about 60 definable law practice areas. But these sixty or so major categories have over 1,000 sub-specialties. One of the major practice areas is criminal defense, and under the general sub-category of “motor vehicle crimes,” drunk driving defense (DUI) is a well-recognized and highly specialized sub-specialty of criminal defense in America. 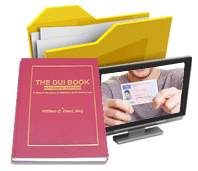 All three partners at our DUI law firm in Atlanta GA are legal book authors, with Mr. Head having over 12 DUI books to his credit. A criminal justice lawyer who, through experience in courtrooms, has acquired specialized and advanced training in forensic science, infrared spectroscopy (breath alcohol test devices), blood testing analytics, field sobriety test protocols, drug testing and toxicological effects, and alcohol absorption, distribution, metabolism, and elimination is a candidate to be your best DUI lawyer. 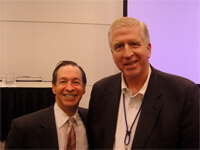 Plus, all three of our DUI law firm’s partners are regular speakers at DUI seminars, talking about Georgia DUI law. 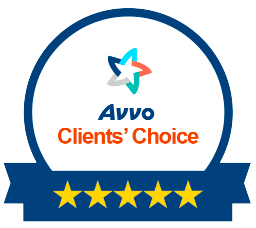 These criminal defense specialists are recognized by the four top, peer-reviewed attorney rating organizations, and possess the knowledge and track records that justify being categorized as one of the best DUI lawyers in America. 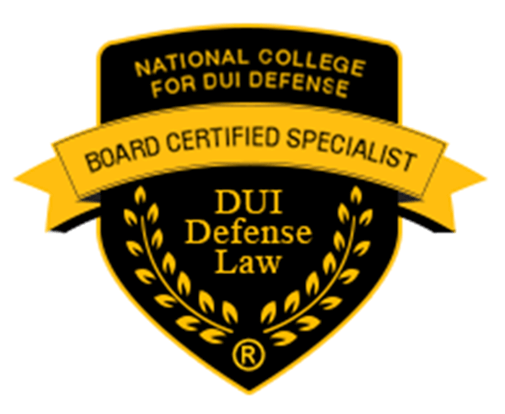 These are Board Certification by NCDD.com, recognition by Best Lawyers in America, Martindale-Hubbell “av” rated and pre-eminent 5.0 of 5.0 rated, and Super Lawyers. All other attorney ratings are unreliable, and not peer-reviewed. 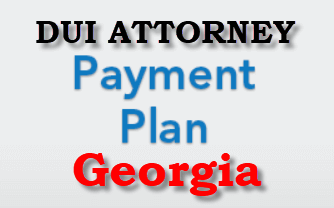 Many newly-admitted attorneys, including Atlanta DUI lawyer William C. Head in June of 1976, first had to be “generalists” when they first came out of law school, because any legal fee would provide an income and put food on the table. The same is often true for surgeons — they must start their medical careers on SOME patient, somewhere, to get started in their careers. Over time, you LEARN the “ropes” and go from a novice, and still “wet behind the ears” to an experienced expert in the field. This specialization and expertise increases the lawyer cost. Are There Free Drunk Driving Lawyers? 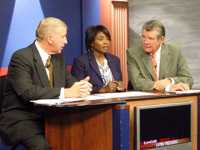 For unemployed individuals, a public defender is ALWAYS available, but most knowledgeable Americans do not have much faith in an appointed criminal attorney, due to case overload in most Georgia courts. Plus, Georgia laws allow the Government to recover public defender costs paid by you. While not all courts have aggressive collection practices, unless the person is totally acquitted of all charges, that is a debt. Plus, a Judge can make repayment of those costs part of probation, and put you in jail for non-payment if it is not paid before the probation is concluded. But, a free DUI attorney is far better than no DUI lawyer at all. It is worth applying for to find out if anything can be suggested to avoid a DUI conviction in your case. So, the common answer to “Do I need a DUI lawyer?” is a resounding YES, of course. So, now we turn to differences in attorneys’ legal practice areas and (ultimately) to a discussion of lawyer cost for a DUI. Neither senior partner Bubba Head nor his law partners, Larry Kohn, or Cory Yager, have ever been a Prosecutor in a criminal case. Their passion, as DUI defense lawyers, is to know how to use the law to protect citizens from intrusions of the Government. This protective mindset and the benefit of doing the same type of criminal defense law for so long instills a CONFIDENCE level in Mr. Head and his partners that is not easy to explain, but they all three know Georgia DUI laws like the back of the hand. For most clients, DUI defense attorney fees at our DUI law firm can be paid over time, since our criminal cases typically last for many months or even years. 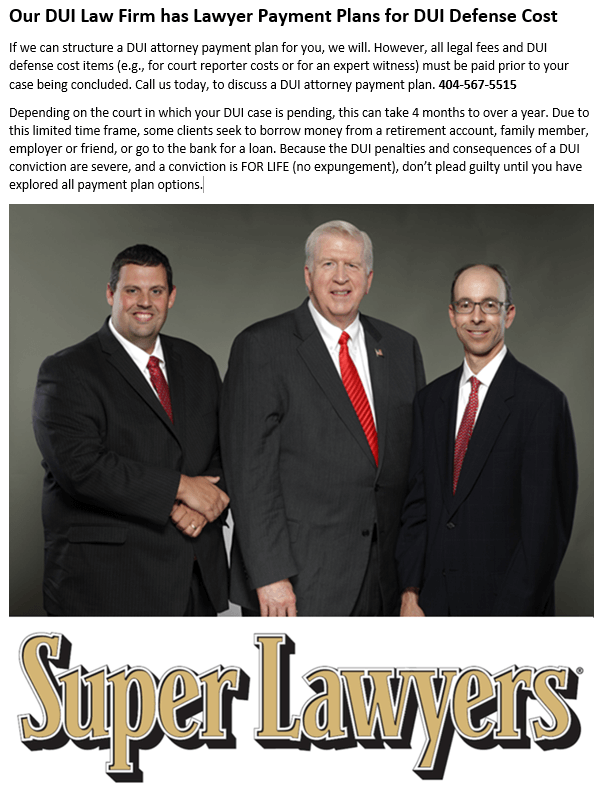 Ask about our DUI attorney payment plans. We answer calls 24-7. Call us TODAY, to get your FREE PDF copy of Mr. Head’s 430-page drunk driving book for clients, FREE case assessment, and FREE lawyer consultation. 404-567-5515. We always respect your privacy.